Illegal and insalubrious settlements of Roma who do not speak the local language and encounter harsh barriers in finding employment: these are the common grounds on which the municipality of Strasbourg and the administration of Darnitsa in Kiev met to learn from each other's experiences. While authorities in Strasbourg have been dealing with these issues since 2008 and are now starting to see results, the war in Ukraine recently forced Roma groups to move to Kiev in hope for a better life prospects. Willing to find solutions to overcome the situation in Darnitsa, hand in hand with the local Community Action Group there, the head of the Administration of Darnitsa, Mr Gennadyi Sintsov conducted a three-day study visit in Strasbourg with the support of the ROMED2 Programme from 30 March to 1 April 2015. Exchanges of experiences, field visits and meetings with the Deputy – Mayor in charge of solidarity policies as well as with other stakeholders were part of the programme. We interviewed Mr Gennadyi Sintsov (Head of the Administration of Darnitsa, Kiev) as well as Ms Marie-Dominique Dreyssé, Deputy – Mayor in charge of solidarity policies to learn more about the situation of Roma in both municipalities, the solutions envisaged or implemented as well as the lessons learnt from one another. ROMED: In a few words can you describe the situation of Roma in Darnitsa? How does the war in the East of Ukraine affect their lives? Mr Gennadyi Sintsov: In the district of Darnitsa Roma currently live in very bad conditions, although this is not related to the war. The problem is that the city authorities did not pay attention to the issues Roma face, which in time made those problems worse. However, because of the war Roma issues have been pushed to a long-range plan. That is why we definitely need people for who the problems of Roma would be the first priority. It is important to understand that other issues must be addressed no matter what and one of these issues is the situation of the Roma. What determines your motivation behind your commitment to improve the living conditions for Roma in Darnitsa? G.S: It seems to me that if we build properly the work with Roma, then first of all we will improve the situation for local population in the district of Darnitsa. Because, like it or not, the conditions in which Roma live today are a health hazard for children and adults alike. That is why I think that by solving the problems of Roma, I solve the problem of the district of Darnitsa. If we do not give Roma an opportunity to learn Ukrainian and if we do not offer them employment opportunities, and instead leave them in the conditions they live in now, criminality will undoubtedly increase and the situation between Roma and the local population will worsen. So long as there are people coming to our city, in our neighborhood, we have to create the maximum set of conditions for them to feel respected and included into the Ukrainian society. I would like to replicate in our district what we saw and heard in Strasbourg. Generally speaking, any person has the right to live in dignity, to have access to a medical examination and we have to ensure the fulfillment of these rights, including for the Roma. I am surrounded by Roma since my childhood, so I know well their life and I have seen that many Roma work hard and fruitfully. I think that in our country there is a bias against Roma and this negative attitude needs to be changed. In Darnitsa a Roma Community Action Group was already established, how do you see your cooperation with the group? What are the main priorities? G.S: We are in the beginning of the process, we will try to internalise the experience of different countries, of different regions of Ukraine. For instance the experience in the Transcarpathian region is different from our own experience. I think that the most important task of this group is to collect the problems faced by Roma in the district of Darnitsa to summarize, analyze it and together with the help of NGOs and donors, to try to solve these problems. I think the work of this group is productive. And even this visit is one of the results of the group’s work. One of Council of Europe’s representatives visited us and learned more about our work and the results, and that is why the Council of Europe supported our visit to Strasbourg. In what way is the dialogue established between the CAG and your administration important in the design of projects/ activities towards Roma in Darnitsa? G.S: In our administration we have established a special working group on Roma issues. That group has regular meetings with the CAG’s members and they are planning their work together. There is also one person responsible for the coordination of work of this group, who is reporting to me and our colleagues about the developments of the work. What is your relationship with regional and national authorities? G.S: I am the head of Darnitsa regional state administration of Kiev city. Are there barriers you encounter in your initiatives for Roma inclusion? G.S: There are prejudices of local people towards Roma that live next to them. They think that Roma steal, that they spread diseases; that they do not want to work nor study. Therefore, we should make an effort to change this attitude. This is the first step we have to make. The second is that our country always seems to have lots of problems that are more important than the problems of Roma, and we first need to solve our national, internal issues, to finish the war, to provide every Ukrainian in need with social housing etc. Therefore, all these problems are on the way to solving the problems of Roma. But I believe that if we do not pay attention to the problems of Roma now and leave them in the same conditions, later we will need even more efforts and it will cost even more to address these problems. What were your expectations before the study visit? Where they fulfilled? G.S: I was not expecting that in Strasbourg administration there are people who are dealing so closely with the problems of Roma. I thought it was one of their small tasks among a broader work. And it turned out that there are especially appointed people in the municipality, who have a deep knowledge of those issues. For me it was a surprise that there are people who know personally many of the Roma in the settlements, regularly communicate with them and are not sitting in their offices. This is because in our case, our officials are trying not to go outside of their offices. In Strasbourg the problems of Roma are solved in the field and not in the offices, this is a very pleasant surprise to me. I believe that it is a big achievement of the Municipality and the Council of Europe to find human and financial resources to address the problems of Roma, because we do not have such an opportunity. I am amazed there is an individual approach to each family. It’s my most memorable trip. Expectations were even more than justified. How do you see the follow-up to the visit and the type of actions you could take based on the examples in Strasbourg in Darnitsa? G.S: I think that we need to implement a few steps in the district of Darnitsa. First, we need mediators that will help us to better understand the problems of Roma; we need people who know how to deal with Roma and understand their language. The main problem is communication, the Roma do not understand us [n.r. as they do not speak Ukrainian, their mother tongue is Hungarian]. Second, we need to conduct sanitary cleaning of the Roma settlement. In Strasbourg I saw clean Roma settlements, the garbage was removed, people take care of their living space. For us this is the example of our next work in the settlement in Kiev. The next step is to organize courses of Ukrainian language for Hungarian speaking Roma. Because the Roma who live in our district need to understand the local population, this will help to avoid many conflicts, it will help in communication with the authorities, as well as with the police and the administration. It will help them to find more qualified jobs. Children should also be taught Ukrainian language and we can organise different age groups. Well, the third step is the medical examination of the Roma living in the settlements, as a prophylactic measure. This will also help to change the stereotype of the local population that the Roma are a hotbed of disease spread. At least once every six months we should conduct x-ray examinations and blood tests on hepatitis and other diseases. These three steps are our minimum and programs that can be our starting point for broader programs for Roma people. ROMED: What is your position within the City of Strasbourg and within it what are your competences concerning Roma and Travelers? 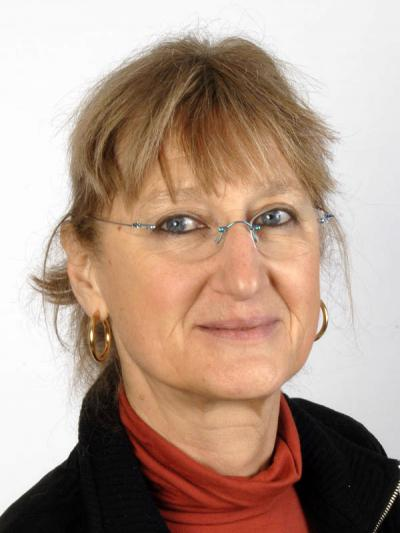 Ms Marie-Dominique Dreyssé: I am in charge of solidarity policies – these include all transversal social policies across a wide range of interventions, with a focus on persons in a precarious situation and/or homelessness. This includes some Roma but not only. The “Roma Mission” [n.r. within the administration of the city of Strasbourg] was created under my responsibility two years ago. Can you tell us in a few words what are the projects implemented in the city of Strasbourg concerning Roma? M-D.D: The city of Strasbourg has always put in practice specific measures for the hosting of travelers. We have halting sites in line with current legislation, as well as sedentarised settlements – out of which one in particular is quite large – aiming to gradually replace substandard housing and thus achieve better living conditions for the persons living within their premises by providing standardised houses instead. In fact, for the past few years we are experiencing a new phenomenon, meaning the arrival of poor migrants of Roma ethnicity, who settle on the public space and build what one could call shanty towns. This is a development which first appeared in 2000 in Strasbourg. Since 2008 we have been dealing with this file, ever since we have been elected, and I have taken responsibility for it specifically. We have decided to tackle the issue under a poverty angle, related to the precarious, undignified living conditions which were clearly not ensuring basic human rights. Since when has the city of Strasbourg manifested the will to invest and to conduct projects for the improvement of the living condition of Roma in Strasbourg and what was the triggering factor for this commitment? M-D.D: Everything started in 2008 when we discovered these shanty towns and met with Mr Thomas Hammerberg, the then Human Rights Commissionner of the Council of Europe. We tackeld the issue through a pragmatic approach of discrete, albeit real dialogue with government representatives. In this manner we were able to put social mediation in practice which allowed us, during one year of partnership with the various State services, with local NGOs, with services of the City of Strasbourg, to create proximity dynamic, meaning a dynamic of contact and dialogue as well as of listening to the people living in these shanty towns. After one year, the City of Strasbourg designed the project for a temporary living space to give these persons the opportunity to enter this insertion path if they wished to remain in Strasbourg. The preparations took a certain amount of time and in 2011 the first of three of such spaces was opened with around 100 persons living within its premises. This space is still open today. The persons choosing to enter these spaces are thus on an integration path. The aim is not for them to stay within this space as it is meant to be a transition one. Thanks to the social support provided by the operators managing these spaces, these persons have the possibility to seek their own way out of poverty. We provide them with some of the means, of course, but they have to make their own project for the future. This approach has been giving results as some of them found a job and have left the space to live in apartments. You mentioned that listening to this population is important, and this touches upon the issue of participation. How is this ensured with the Roma community? How are they involved in the decision making process? M-D.D: Outside of the temporary living spaces this is more complicated to achieve, but within these spaces it was right from the start that we had created “social life spaces” which allowed for monthly friendly meetings to discuss about the issues that the people living in the space wanted to bring up. Of course, it was a learning path for us as well, the first of such meetings being completely chaotic and hard to control. However, little by little, people understood that these “social life spaces” were the place where they could solve their daily issues, where they could bring up their worries for the future and it was in particular the problem of employment that used up a lot of time during these meetings. 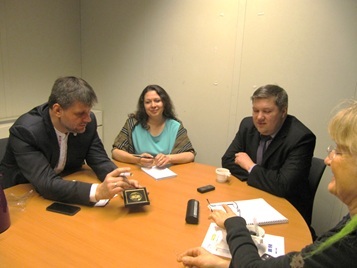 Our encounter today is centered on the study visit of a delegation from the Darnitsa administration in Kiev, Ukraine. How have you experienced this visit and what is the added value for such a visit in your opinion? M-D.D: It is always interesting to meet people who have a different experience with migration in Europe. It’s a subject which is a reality for many countries, if not all European countries. It is mainly about the migration of the poor, which puts people in a very difficult position. In each country the access to services is not the same and probably nor is the size of the phenomenon. However, comparing these experiences and the actions lead some 2000 km away make us question certain aspects of our practices and brings, I believe, some elements which can be of help to our visitors as well. Through such discussions you probably also touch upon the obstacles you can encounter when implementing such projects. In Strasbourg what exactly are these obstacles? M-D.D: The greatest obstacles are not material. It is the omnipresent prejudice against Roma still today which makes very difficult the first procedures, the first contact with employers, with landlords or with services. There still exists, I believe, all over Europe, this difficulty to imagine that someone who is Roma is someone as simple as you and I.
M-D.D: The reaction of the people was stronger when there were “wild” settlements in Strasbourg. Residents were usually annoyed with the proximity of shantytowns and on the other hand, human rights defenders were accusing the lack of action from the government. Since 2008 we have decided not to make too much publicity around our projects and to take action in a discrete manner so as to precisely avoid that some people express their irritation publicly which can make the continuation of the project difficult. But we have managed to hold on through the implementation. In 2012, the government published an interministerial circular concerning the management of illegal camping sites with fundamentals that we had already integrated for the four previous years in the city of Strasbourg. This was a moment when what we did was put in the spotlight and debate became thus more public. Today this is even more so the case as we have within the local Council elected officials coming from the Front National who are extremely opposed to the support we provide to Roma. Today, these are gut reactions, political reactions, arriving at quite particular moments, but this is not a local subject and I hope it will remain this way. A commitment which started in 2008 with a concrete implementation as of 2010. After 5 years, what is the assessment? Are the results promising? Is there more positive than negative things to it ? M-D.D: The action that we had designed has accomplished its objectives since the path that we had envisaged – of entering an assistance logic, of granting access to rights, to schooling for children, to health facilities – all of this is part of the routine sort of speaking. This is also the case for the first steps into a normal working life, and for the normalization of the contact with social landlords. For these reasons we think that this pragmatic approach makes sense and it proves to those who accuse what we are doing for this community, that Roma are “integrable” as they say. I for one, simply think that if provided with the right framework allowing for their development, these persons take the same steps as anybody else. What would be the advice you would give to other municipalities who would want to implement similar projects as the ones created in Strasbourg ? M-D.D: The commonplace for everyone could be building a project which is deeply rooted in the local reality. Being pragmatic about it, starting with an analysis of the current state, as well as with an integration approach rather than an assimilation approach, taking into account the fact that those targeted are fully-fledged persons, with particular know-hows, with a knowledge base, most of them with a qualification in a particular branch. Authorities need to assume that these persons can continue to live a normal life, as citizens, wherever they might be, so long as the environment allows them to. Indeed, when one finds himself in the street, without any means of living and that one spends his day wondering what he would be eating, where he would be sleeping, or when the police could arrive – these are not the best conditions to build or imagine a dignified future. The first thing to be done is to improve the living conditions of the persons, to trust them and provide them with a minimal framework which enables people in a difficult situation as well as those supporting them to stick to a set of references, to remind of the existence of this framework on a regular basis, as things can evolve quite rapidly.